Tawfiq S, Aziz Z, Sultan A, Amer H, Sadek AM. A 20-year-old male presented with multiple, generalized, asymptomatic discolored macules of 7 years duration. Examination showed bilateral, symmetrical sharply marginated macules with raised borders and hyperpigmented atrophic centers. Histopathology revealed atypical lymphocytes associated with epidermotropism. Cutaneous lymphomas represent the second most common group of extra-nodal lymphomas . Mycosis fungoides (MF) is the most common cutaneous lymphoma, which is a generally indolent peripheral T-cell lymphoma initially, and preferentially presenting in the skin, and showing distinct clinical, histological, immunophenotypical, and genotypical features . A considerable number of reports have documented MF mimicking other dermatoses . A 20-year-old male presented to our out-patient clinic suffering from multiple, generalized, asymptomatic discolored macules of 7 years duration. The lesions started on his forearms with subsequent spread to the rest of his body. The condition was resistant to treatment with topical antifungals for 6 months as it was diagnosed as pityriasis versicolor as described by the patient. 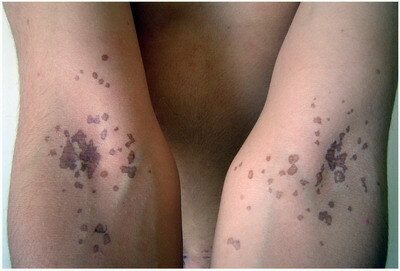 Examination of the patient revealed numerous hyperpigmented to violaceous macules. Their sizes varied from 3 to 5 mm in their diameters. Closer examination showed that the macules were sharply marginated, having raised borders and hyperpigmented atrophic centers. The lesions were distributed in a bilateral fashion on his cubital fossae (Fig 1), trunk (abdomen, chest and back) (fig 2), face, neck and extremities (thighs and dorsa of hands). Our clinical differential diagnoses included porokeratosis, atrophic lichen planus or epidermodysplasia verruciformis. Histopathological examination of the H&E stained biopsy revealed an upper dermal lymphocytic infiltrate which was encroaching on the dermo-epidermal junction, many lymphocytes were atypical and even escaped into the epidermis (epidermotropism) (Fig 3). 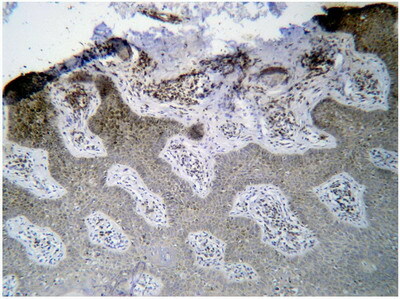 On immunohistochemical staining, the lymphocytes were shown to be positive for staining with CD4 (Fig 4). From the previous clinical and histopathological, the diagnosis of "cutaneous T-cell lymphoma with porokeratosis like lesions" was reached. Cutaneous T cell lymphomas (CTCLs) have a wide variety of clinical and histopathological manifestations but are all characterized as extranodal non-Hodgkin lymphomas of malignant, mature T lymphocytes that target and persist in the skin . MF accounts for almost 50% of all primary cutaneous lymphomas. It typically affects older adults (median age at diagnosis: 55-60 years; male-to-female ratio: 1.6-2.0:1), but may occur in children and adolescents . Regarding clinical presentations of MF, in some cases, the disease starts with nonspecific scaly lesions resembling chronic dermatitis, parapsoriasis, or other inflammatory dermatoses. In other instances, patients present with more distinctive irregular, well-circumscribed, scaling patches of variable sizes. 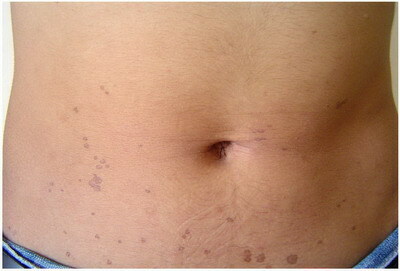 The number of lesions is also variable. Pruritus is common and often severe. It usually takes several years until the patches progress into plaques and tumors, which may then ulcerate. Lymph nodes and internal organs may become involved in the later stages of MF . None of the previously mentioned symptoms and signs was consistent with our patient. Zackheim and McCalmont, 2002 reported two cases suffering from CTCL with atypical presentations, as one of them presented with psoriasis, plaque type, like lesions and the other with erythema annulare centrifugum like lesions. They also comprehensively reviewed reports of various dermatoses simulated by MF and a total of 23 reported cases of dermatoses mimicked by MF were found and stated that the term "the great imitator" is appropriate for MF . From these 23 cases, three cases were described to have presented with CTCL with porokeratosis like lesions, the first two were reported by Hsu et al., 1992 who described two black patients CTCL that clinically resembled disseminated superficial actinic porokeratosis . The third one was described in 1993 by Breneman and Breneman who reported a case of CTCL mimicking porokeratosis of Mibelli , which is most consistent with the lesions described in our patient. Histopathologically, early patch lesions in MF show superficial band-like or lichenoid infiltrates, mainly consisting of lymphocytes and histiocytes. Atypical cells are few, and mostly confined to the epidermis (epidermotropism) . In typical plaques, epidermotropism is generally more pronounced. 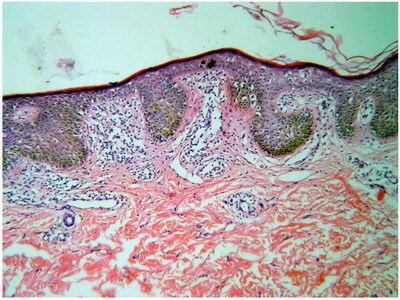 The presence of intraepidermal collections of atypical cells (Pautrier microabscesses) is a highly characteristic feature . With progression to tumor stage, the dermal infiltrates become more diffuse and epidermotropism may be lost. The tumor cells increase in number and size . The histopathological findings in our patient were more consistent with the characteristic features of the patch stage MF. Immunophenotypically, the neoplastic cells in MF have a mature CD3, CD4, CD45RO, CD8 memory T-cell phenotype . Clonal T-cell receptor gene rearrangements are detected in most cases. Chromosomal loss at 10q and abnormalities in p15, p16, and p53 tumor suppressor genes are commonly found in patients with MF . Regarding the treatment modalities, as long as the disease is confined to the skin, skin-targeted therapies are preferred. In patients with limited patch-stage disease topical steroids or bexarotene gel can be used. Biologicals, traditional and new retinoids such as bexarotene are increasingly used in the treatment of MF. Multiagent chemotherapy is generally used in case of unequivocal lymph node or systemic involvement, or in cases with widespread tumor-stage . 1. Kim EJ, Hess S, Richardson SK, Newton S, Showe LC, Benoit BM, Ubriani R, Vittorio CC, Junkins-Hopkins JM, Wysocka M, Rook AH: Immunopathogenesis and therapy of cutaneous T cell lymphoma. J Clin Invest. 2005; 115: 798- 812. 2. Kazakov DV, Burg G, Kempf W. Mycosis Fungoides. In: Cutaneous Lymphoma. G Burg, W Kempf (editors). Taylor & Francis Group, Florida, 2005, pp. 101-12. 3. Zackheim HS, McCalmont TH. Mycosis fungoides: the great imitator. J Am Acad Dermatol. 2002 ; 47: 914-8. 4. Kazakov DV, Burg G, Kempf W. Clinicopathological spectrum of mycosis fungoides. J. Eur. Acad. Dermatol. Venereol. 2004; 18: 397-415. 5. van Doorn R, Van Haselen CW, van Voorst Vader PC, Geerts ML, Heule F, de Rie M, Steijlen PM, Dekker SK, van Vloten WA, Willemze R. Mycosis fungoides: disease evolution and prognosis of 309 Dutch patients. Arch Dermatol. 2000; 136: 504-10. 6. Abel EA, Wood GS, Hoppe RT. Mycosis fungoides: clinical and histologic features, staging, evaluation, and approach to treatment. CA Cancer J Clin. 1993; 43: 93-115. 7. Hsu WT, Toporcer MB, Kantor GR, Vonderheid EC, Kadin ME. Cutaneous T-cell lymphoma with porokeratosis-like lesions. J Am Acad Dermatol. 1992; 27 (2 Pt 2): 327-30. 8. Breneman DL, Breneman JC. Cutaneous T-cell lymphoma mimicking porokeratosis of Mibelli. J Am Acad Dermatol. 1993; 29: 1046-8. 9. Smoller BR, Santucci M, Wood GS, Whittaker SJ. Histopathology and genetics of cutaneous T-cell lymphoma. Hematol Oncol Clin North Am. 2003; 17: 1277-311. 10. Nickoloff BJ. Light-microscopic assessment of 100 patients with patch/plaque-stage mycosis fungoides. Am J Dermatopathol. 1988; 10: 469-77. 11. Diamandidou E, Colome-Grimmer M, Fayad L, Duvic M, Kurzrock R. Transformation of mycosis fungoides/Sezary syndrome: clinical characteristics and prognosis. Blood. 1998; 92: 1150-9. 12. Ralfkiaer E. Controversies and discussion on early diagnosis of cutaneous T-cell lymphoma: phenotyping. Dermatol Clin. 1994; 12: 329-34. 13. Whittaker SJ, Marsden JR, Spittle M, Russell Jones R. Joint British Association of Dermatologists and UK Cutaneous Lymphoma Group guidelines for the management of primary cutaneous T-cell lymphomas. Br J Dermatol. 2003; 149: 1095-107.